"Two of the best aspects of the play are the violence and fight choreography. These elements are highly dynamic, beautifully choreographed, and rightly overwhelming. The gore is seamless and realistic, and Carl Brandt Long's full use of such a small space filled with six actors and the audience's toes is impressive as it clearly captures the chaos." Ryan Sellers and Carl Brandt Long. "Carl Brandt Long proves he’s multi-talented. 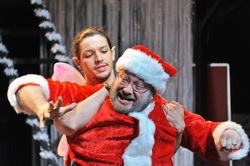 In addition to playing Santa himself, he contributes solid fight choreography to this piece, which is integral to the success of the final scenes." ". . . 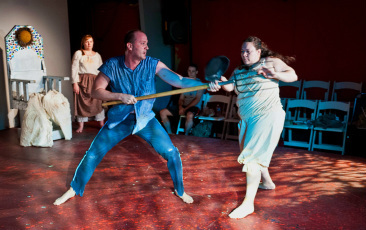 Most notable are the play’s cringe-worthy fight sequences choreographed by Fight Director, Carl Brandt Long (also cast as Billy). Consuming over half of the play’s total running time, the brawls alone are worth the cost of a ticket." ". . . As a fight play it’s an unqualified success. There’s more fighting than dialogue on the Redrum stage. The fight choreography is disgustingly graphic and exciting. If you came for violence, you’ll love this show."